The Gippsland Car Club and its members are to be congratulated on the successful hosting of the AHCC at Bryant Park last weekend. Around 100 competition vehicles from all over Australia converged on what is arguably the best hillclimb venue in the country to showcase the finest in what this sport can offer – and it didn’t disappoint. Friday’s timed practice session was mainly used by those unfamiliar with the track to settle in and learn the foibles of the tricky 1.3km clockwise layout. Five official runs were then conducted on Saturday, but light drizzle meant that everyone was hoping for a fine Sunday when another four official runs at the hill were scheduled. To everyone’s delight, Sunday dawned fine and sunny. Malcolm Oastler (NSW) was Chief Designer and Technical Director of the BAR (formally Tyrrell) Formula One team before moving to Jaguar Racing as their Chief Designer in 2003 and 2004, he obviously knows his way around open-wheelers and on Sunday smashed the outright Bryant Park record in his home-built, turbo-charged, Hayabusa-engined OMS28 Formula Libra car. 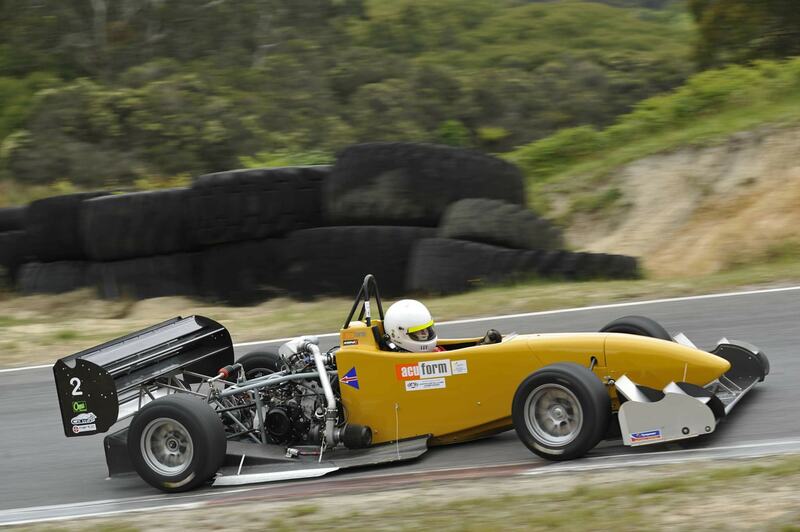 Local driver and race car builder, Brett Hayward in another home-built, Hayabusa-engined special also broke the previous outright record, but couldn’t match Oastler’s times. Not everyone was vying for outright honours and there were plenty of classes to cater for the wide range of vehicle types and engine capacities within the field. The Sporting Register was represented by Alan and David Richards in their 2-litre Datsun 120Y Sports Sedan, Jim McNiven in his BMW M3 which ran in a new class for Road Registered cars with engine capacities between 2 and 4 litres; and Steve Schmidt driving his Morris Cooper S in the up to 2-litre Group N Historic Touring Car class. Alan and David swapped fastest times between themselves all weekend in what was the first successful outing for this car in close to two years since the engine was updated to a Nissan SR20. Both drivers were more than happy just to have completed the event, but at the end of the day Alan’s final run of 62.07 eclipsed David’s best time by little more than a tenth of a second to place them 5th and 6th in the class. Jim’s M3 BMW was up against a current model Mercedes 2-litre, turbo-charged, all-wheel-drive hot hatch and Jim knew from the outset that he was out-gunned. Never-the-less Jim drove hard on each run and managed to get his times down below the psychological one-minute barrier with a 59.87 on the second-last run of the day. There was no catching the Merc though – its best time was almost two seconds faster. 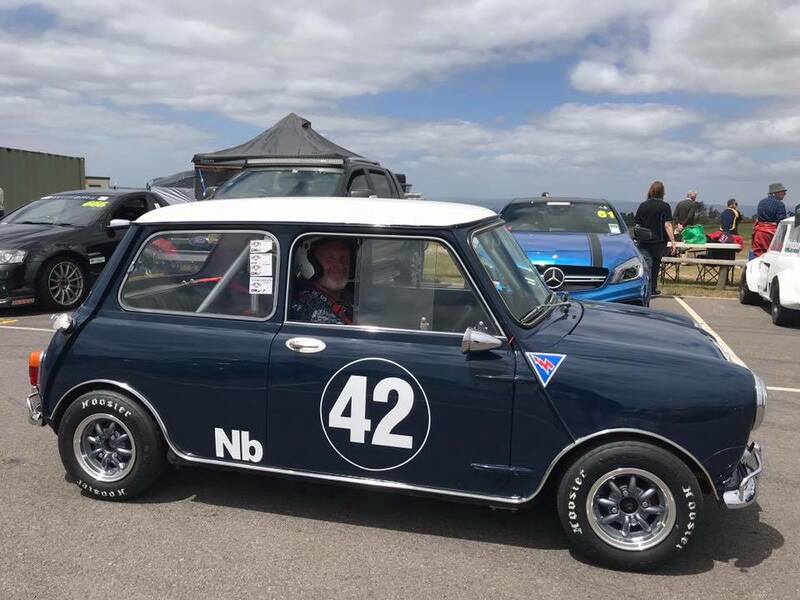 Steve’s Cooper S was engaged in the usual titanic battle all weekend with the similar Cooper S of Peter Weymouth-Wilson. This time, however, Peter was watching from the sidelines whilst his son Steven took control behind the wheel. During the weekend the class lead changed back and forth between the blue and green Minis with both drivers posting personal best times on top of previous PBs. Youth eventually triumphed over experience, even though your correspondent’s best time of 61.52 was over a second faster than what the car and driver had achieved previously. It was tremendous to see so many Sporting Register members supporting the event with their presence, either as spectators or as volunteers. John Moss fulfilled the roles of Assistant Clerk of Course and Eligibility Officer whilst his wife Marlene helped out in the canteen, which seemed to be very busy from the word go! If I have missed naming any other Club members who assisted with the running of the event, I apologise and thank them along with all the other volunteers whose time and commitment helped make this event the success it was. 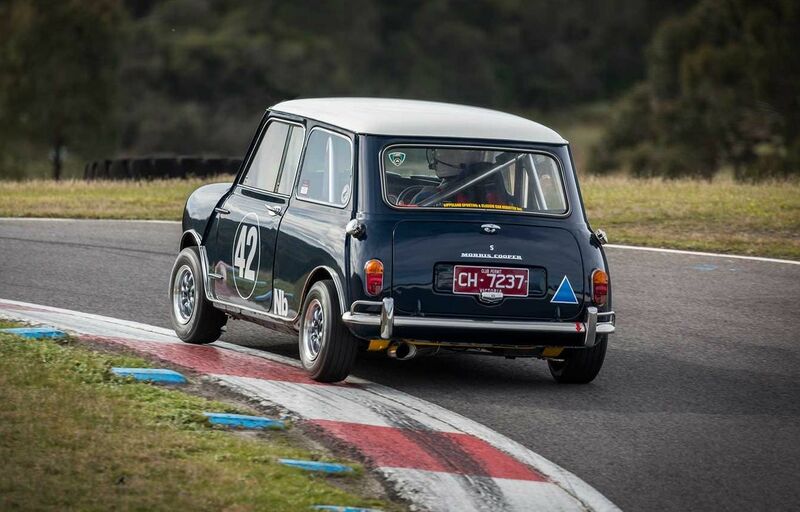 Next year’s Australian Hillclimb Championship will be run at Mt Panorama, Bathurst. I believe it will run in the reverse direction to the 1000km race, starting on Conrod Straight and running uphill through Forests Elbow, the Dipper and the Esses, finishing the other side of Skyline. A pretty steep climb for a Mini !